i have 3-4 flight data file in one base and rover log file. i can’t distinguish what’s what and know which flight is which. 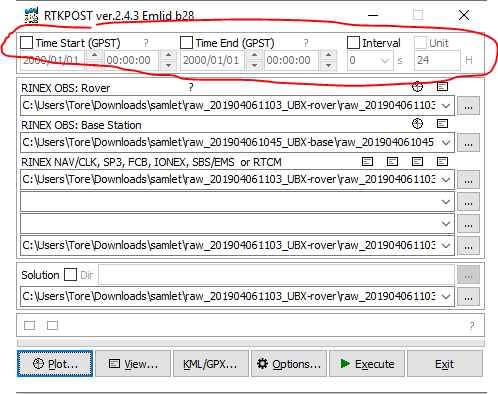 i have processed my RTKPOST and got all obs,nav,ubx files. how to separate each flight?? i think it’s something to do with separate it with time?? thank you so much for the hint. now i’m trying to find out how to clean my files. this is what i did after i processed with time frame selected. but if i zoom in there are ireelevant data it’s in there so i’m wondering how can i clean up and just keep the required path as i need from this point? 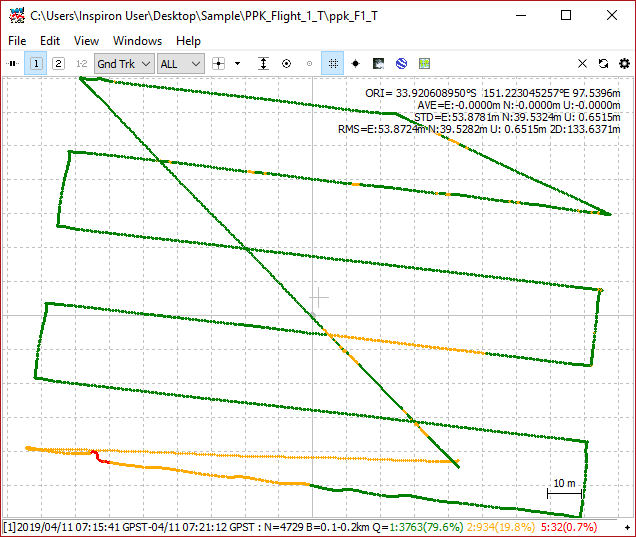 Do you mean remove float/singel or a section in the midle of current plot? For what application do you need to clean up the plot? I kind of have to ask as it depends on what data is needed. i just thought that i have to clean the files so it’s easy to see and view and process. if it doesn’t effect the data then i don’t need to … i’m still learning! If its just for the visual part in RTKplot you can use the Time edit in the menu to set wanted timeframe. Also sort out FIX by using Q1 from the drop down menu and change setting in general. This will not affect the .pos file.